Please join us for morning prayer in Gundale Chapel at 8:45-9:00 am. This is a contemplative Christian service with music. Today student Kyle Thompson will share about Vitalis of Gaza. Rhonda Whiteneck, of the Social Security Administration, will present a comprehensive look at Social Security benefits and the role they play in retirement. Come to learn more! Will be performing during chapel this morning! Join us in chapel to hear Professor Mark Tranvik, religion department, preach on the reformation and Augsburg Concert Band play. On Tuesday, October 30th join the Augsburg Psychological Association in watching Shutter Island. The movie will begin at 7pm in Hagfors 150B. Popcorn and candy will be provided. Afterward there will be an (optional) discussion about the movie. Often in Minnesota, it doesn't really feel like summer until July arrives. However, for 16 McNair Scholars, this month is less about the blue skies and relaxation as it is about long hours spent hunched over reference books, computer screens, and lab equipment. July marks the peak of the scholars' summer research projects. 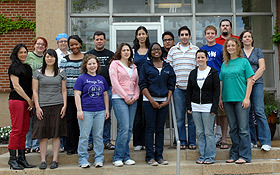 The McNair Scholars Program offers undergraduate students the unique experience of participating in graduate-level activities. One component of the program is an intensive 10-week long summer research project. Participating students spend an average of 40 hours a week exploring their topics, developing a thesis, collecting and reviewing data, and preparing a formal presentation of their findings.